Today, Sparkle announced the launch of GeForce GTX 560 SE graphics card aiming at midrange market. As the most expected superstar product for mainstream market in the first half of this year, this card features a mature 40 nm GF114 GPU, delivering the ultimate next generation gaming experience. The excellent performance not only leads over similar competing products, but also shows no way inferior to GeForce 5 series. Now is the perfect time to upgrade your graphics card at a surprisingly affordable price! Sparkle GTX 560 SE is built with the best quality materials and introduces ultimate fashion and style with simple grandness. The short PCB design allows the card to be installed into small chassis. The top front fan cover is made of high quality matt black aluminium which adds a more elegant touch to the cold mechanical look of graphics card. More importantly, the aluminium surface area improves the heat transfer efficiency significantly. Sparkle GTX 560 SE packs 288 CUDA Cores, a 192-bit memory interface, a core clock of 736 MHz, a 1 GB GDDR5 memory and a pair of 6-pin PCI-E power. The display output configuration includes 2 Dual-Link DVI ports supporting resolutions up to 2560 x 1600 and 1 mini-HDMI connector. Whether it's exceptional gaming or HD video experience, Sparkle GTX 560 SE brings unprecedented visual pleasure to consumers! In addition, the powerful 9-cm fan successfully boosts up cooling performance and operates stably even at high speed. This will perfectly solve noise problem and significantly extend the lifespan of the cooling fan. Sparkle GTX 560 SE balances performance, power consumption and noise!This card shows a 36% increase in 3DMark 11 score compared to the GeForce GTX 550 Ti reference board, only 20% behind GeForce GTX 560. Furthermore, Sparkle GTX 560 SE can do wonders to increase excellent performance per watt by 42% compared with GeForce GTX 550 Ti. This card also provides an extremely quiet environment (when operating at full speed) at only 32 dB quieter than GTX 560. 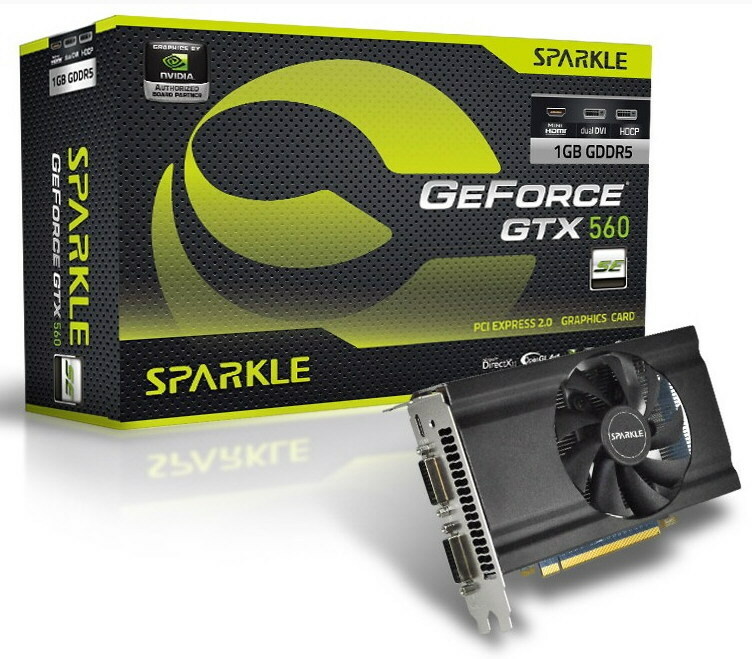 Sparkle GTX 560 SE improves overall performance and offers a great value for money at a 25% less than GeForce GTX 560 price. It is an ideal solution for gaming PC applications requiring reliability, high performance, and low power consumption at a low price. Isnt Sparkle going to launch the GTX680?! btw.. what is the price of this card(i see words 'affordable price' but no price)? Considering the stats on the card. Compared to the 460, 550 TI and 560 (non TI). If this card is anything over $115, it is the biggest rippoff ever. newegg has one and its 135. also it requires two 6pin power. For $5 more or $120 after mir you can get a 6850 which smokes this thing and only one six pin. 460SE has 256bit memory, same amount of cuda cores and memory etc.